18 –Rhetta Young (Sending Out An) S.O.S. 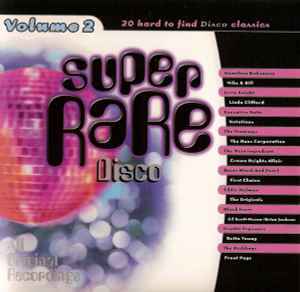 Release name printed as "Super Rare Disco Vol.#2" on the back cover. really had to WORK, unlike today's DJs who "have it made" with their cookie cutter house and techno mixes made with drum machines, and extended so long that you can go to the bathroom or take a walk to the bartender and still have time for a nice long overlay. Most of the versions here are impossible to find, hence the compilation's title. Another cool thing about owning this is that you can hear the original shorter version of "Ten Percent" by Double Exposure, and you can hear what was done by Walter Gibbons to change and lengthen the song, what he did to make it more "DJ friendly" and underground. Same thing with Bohannon's "Let's Start the Dance", which was remixed 2-3 times since the original LP version featured as the opening cut on this compilation...it's pretty cool to have a historical reference point to compare originals with their later remixes.